Our website brings you one of the scarcest small size gold bullion coins, the 20 Mark Preussen Wilhelm II gold coins, which are found in a Brilliant Uncirculated condition. These Prussian gold coins were minted between the years 1888, when Wilhelm II ascended to the throne following his father Frederick who only reigned in that same year, and 1912. They were minted by Prussia, which at that time was a German territory, the most wealthy of all, that is why their gold coins are in demand. The 20 Mark Preussen Wilhelm II gold coins are often compared with the renowned British Sovereigns mainly because they weight almost the same and are sold at an appropriate price for that reason, even though it is often argued that they price should be higher for the German coins because they were issued in a scarcer mintage. The 20 Mark Preussen Wilhelm II gold coins weight 7.16 grams which is the equivalent of 0.2304 troy ounces of gold and have a diameter of 22.5 mm. These German gold coins were minted in a purity of 90.00%. The obverse of the 20 Mark Preussen Wilhelm II gold coins depicts the bareheaded portrait of the German Emperor, facing right. The inscriptions found on this part of the coin are WILHELM II DEUTSCHER KAISER KONIG V. PREUSSEN. He was a leader famous for his native intelligence however he was also tactless and was on the verge of starting a war in Europe. The reverse of the 20 Mark Preussen Wilhelm II gold coins presents the crowned arms of Germany on the chest of a spread eagle. It is also inscribed the face value of 20 MARK, the minting year 1898 in the case of our displayed gold coin, and the inscription DEUTSCHES REICH. These 20 Mark Preussen Wilhelm II gold coins can be considered famous because they are the last gold coin minted before the starting of the Second World War therefore until 1945 no other gold coin were minted. For collectors are desirable due to their scarce mintage therefore it is very hard to find this coin in a good condition. Even though they are so rare they are not priced accordingly, having only a small premium added to the gold spot price. So it would be a good occasion to invest into a 20 Mark Preussen Wilhelm II gold coin because in the future it will certainly be priced taking into consideration its rarity and popularity. The 20 Mark Preussen Wilhelm II gold coins will remember historians of how great and wealthy the Prussian monarchy was before the outburst of the First World War which brought with it a terrible economic hardship for Germany. Or they can be regarded by investors for what they are: bullion gold coins of a considerable purity that will increase in value once demand for these coins increases and with the increase of the gold spot price. 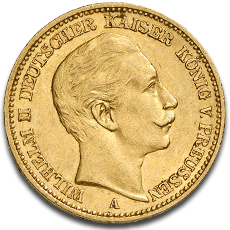 The 20 Mark Preussen Wilhelm II gold coins are available on our website at a price that is free of VAT.